It's time to look for your dream job with a cruise line! The cruise industry is booming! There are a record 42 ocean and river cruise ships under construction or on order for deliveries over the next two years (2019 - 2020). Twenty of these are large cruise ships carrying over 1,000 passengers each. Thirteen are mega cruise ships which each carry over 4,000 passengers. This is in addition to more than 167 cruise ships major cruise line companies have introduced since 2000. As this boom continues, 2019 - 2020 will be an outstanding years for new cruise ships. This is great news for those looking for cruise ship employment and other cruise line employment. Each of these new ocean cruise ships provides an average of over 1,100 new jobs needed to staff the cruise ship and an additional 500+ jobs to provide the support services. This is all great news for you! There has never been a better time to be looking for work in the cruise line industry. Whether you are looking to work on for a cruise line for a short-term job change or a long term career, the cruise line industry has a place for you. On average cruise lines employ one crew member for every two cruise ship guests. This means it takes about 1,000 crew members to staff a cruise ship that carries 2,000 guests. In addition, for whatever reason, turnover on the cruise ships is generally pretty high, so cruise lines need to fill an awful lot of positions every year and thus they are ALWAYS HIRING! The average initial contract generally ranges from 3 to 9 months. With all of your living expenses, medical insurance covered by the cruise line, a high percentage of your earnings can be banked, thus giving you a nice amount saved after each contract. Free room on the cruise ship. Usually either a single stateroom or a shared stateroom with another employee. 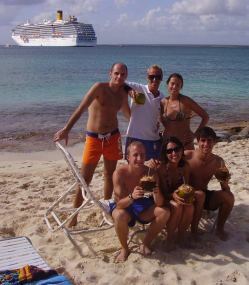 CruiseJobFinder will provide you will all of the resources you need to land an exciting career in the cruise industry. Start your cruise ship job search now! After using CruiseJobFinder you will know whether working on a cruise ship is right for you! We answer all of your questions about the industry - especially how to get a job. Our staff have been researching the industry since 2002! Our knowledge is based on extensive interviews with current and former employees, hiring managers, and others who know the ins and outs of cruise line hiring practices. And detailed cruise line profiles with hiring information by department, and much more. To find out more questions to commonly asked questions about working on a cruise ship, please read Cruise Line Employment FAQ. Do I need to be a United States Citizen to work for a cruise line? No! To work on most cruise lines you do not need to be an American citizen. This is because most cruise lines are foreign flagged and thus are not regulated by United States labor laws. So in many cases, cruise lines can hire people from any country they choose.